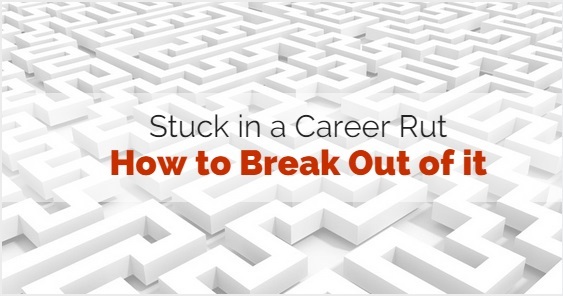 If you have been into a job for a long time or you might still be new to the work force, the feeling of stuck in a career rut can happen at any given point of time in your career. This feeling could arise for various reasons, probably you might not like your job, or you would be living in a comfort zone and not putting efforts to explore more. Or you would be too scared to leave the security blanket of your job. The reason could be any of the stated points or something else. It might not be possible for everyone to get into their dream job immediately, yet the good news is that everyone with some patience and bringing some changes in their attitude can get out of this career rut. In case you are not able to find newer options , just by bringing some small changes in your life will guide you to get out of this. Or else if you want to pursue and find your dream job then with persistent and attitude that can also be worked out. Every job in the word has their own pros and cons. Infact if you feel you are stuck it is good to re look at it and compare them to see which is higher in number the pros or the cons. If you feel the pros are higher in number then you might need some smaller changes to make in your professional front, if you find cons to be in greater number then a serious measure is to be taken. Everyone has a tendency to live within a comfort zone, when someone starts a career the enthusiasm to learn new things is high but with time most of the people tend to settle into their zone. The idea to learn and experiment professionally is lost. To get out of this rut take additional responsibilities or try to learn a new job within your office, talk to people in different departments and take initiatives. Try to review yourself and your job. If you feel stuck see and analyse if the problem is in your attitude or in office. Sometimes people are not keen on grabbing opportunities offered or do not show enthusiasm towards work therefore team mates or bosses drift away from them. or the issue could be you might not be appreciated or getting credits for your work and efforts, which can lead to loss of interest in your work. No matter how good the situation can be the tendency to complain and fret about everything is common among people. Try to bring a change in your attitude and see the better of everything. Sometimes by complaining about the workplace all the time one tends to miss out on the good in that place. Look and see the brighter side of your work, the benefits and opportunities you will be getting there and take full advantage of the same. Too much work also makes a person feel like begin in a rut. It is important to give at least one hour every day, where you can do some relaxation activity, workout or pursue a hobby. This will help in breaking the monotony of the daily life charging you up for your workplace. Spending that small me time can bring lots of changes in person’s health and attitude. If an error or a mistake is done in an office, it is good to take responsibility and try to fix it. Blaming others for mistakes will harm your reputation in the eyes of others. Hence your colleagues will not take you seriously harming your professional growth. Take charge and step ahead in your life, be it the work or in personal life. If a situation arises then try to deal with it and find the best solution for it. This gives you a lot of confidence to do better in life. Communication is the best way to resolve any issues. If you feel that you are not growing in your career then it is important to discuss it with your boss and colleagues. Let them know how you feel and what are your expectations or what additional responsibility you would like to take in future. The possibility that your boss might not be aware of you being interested in something is quite high. Talking to him will provide a clearer perspective for bothof you and your boss will ensure that you get the best out of everything. If you have been in a same department in same company for a longer time, then it is advantageous to switch the department within your office when an opportunity arises. Since you will be quite aware of the company processes the chances of switching department will be an easy option for the company to process. It is good as it will save a lot of time by looking out a job in a new company where settling into a position will take a lot of time. In case you feel that you have come to a dead end in your company and feel there is not much opportunity left to grab then it is best to search for another job. This will take time to happen but keep looking for it. Even if you find a new job be sure and do a thorough research about the job profile, your interest and understand for how long you can be in that firm. Try to talk to the employees there and know how one can grow in that firm. Sometimes too much work makes a person stressed out. Jobs can be monotonous many a times but since being an essential part of the process it is good to work within it. Monotony can be harmful especially for a career growth. Take short breaks for vacations, travel to a nice place, visit friends and relax yourself from the hectic schedule of your work. Vacations are the best way to charge your batteries up and prepare you for your work effectively. Think if your job is exactly what you wanted. In current competitive world it is difficult for many to recognize their goals and pursue various options in life. It is effective to sit down and try redefining your goals and strategies. Ask questions like if this is really what you want? How to do you see yourself five years down the line? Asking these questions yourself will give you a clear idea about you can grow ahead in future or if you are on the right track. If any of the above points are not working for you then it is good to take career counselling and try resolving your issues. Taking help is always a good idea when you feel there is no way left. Career counselling will guide you to learn your strength and weaknesses letting you know other career options that are available. This knowledge will help you to look for the best in you hence making it easier for you to decide your future. Award yourself or treat yourself with smaller achievements you get in your work. For example, set a target to finish up a certain work in a specific time if you are able to achieve it, treat yourself. This will let you enjoy with what you have in hand motivating you to the benefits of achievements in the work place. Try to learn a new skill relevant to your profession or just as a hobby. Learning new things from time to time challenges helps your brain to get out of the comfort level and explore various areas. New skills learned will help in work since if implemented right will provide you the opportunity to grow further ahead. Sometimes just a small tweak in your attitude and habit brings a lot of career growth. For example, try to sleep on time and get up early in the morning. Spend one hour for your exercise, take care of your health. Eat properly, drink water, play sports and many more such changes relaxes the mind and health. A fit mind and body keeps your brain active and let you think in the positive direction. There is no specific rule to be successful in life and achieve the desired results. The only and best way is to keep trying and learning to achieve your goal. It is important to set a goal or find out a dream or something to motivate you to work towards it. When the mind is set and clear to achieve something the motivation to get it comes by itself hence makes you enthusiastic to do the work. This enthusiasm will help you break the feeling of stuck in the rut, letting you enjoy life to the fullest.